West Cornwall has a fascinating archaeological past, from the Neolithic era to the industrial archaeology of tin mining. 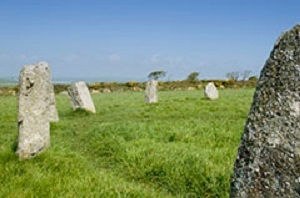 On Trelew Farm, there is a stone circle, called Boscawen–un (pronounced Boss-cow-anoon), described as ‘one of Cornwall’s finest’. Its outer stone is made of almost pure quartz. You can visit this fine example of Cornish Heritage when you stay at Trelwe Farm B&B.